Iâ€™m setting up my E-Throttle for the first time. Following the steps in the help file, the FPS appeared to calibrate perfectly, as verified by the runtime values. When I attempted to calibrate the TPS, it also â€˜passedâ€™ (reported no errors and appeared to move 0 to 100% at the appropriate time, with the TPS gauge following in sync). However, when returning the E-throttle enable back to â€œONâ€, I get an error 73: â€œAux 9/10 supply errorâ€. I checked the runtime voltage of 9/10 per the help file, which it states it should be roughly the same as battery voltage. It is not. Battery voltage was 12.66 and Aux 9/10 was .02. And when I move the FPS, the throttle plate does not move. The odd part is that if I switch E-Throttle enable back to â€œOn-Set upâ€, the throttle blade opens to roughly 60%, the TPS shows 60%, and moving the FPS generates throttle blade movement all the way to 100%. Aside from starting at 60%, it appears to work normally while in set-up mode. I am using a Subaru Legacy 2.5 throttle and an Infiniti G37 FPS. Do you clear all errors? Try to clear the ecu and software error codes first. I gave that a try. The error came back immediately. If you are running 5.0.3 firmware the ECU will turn the throttle off until it sees engine RPM. Try starting the engine and see if the throttle then moves. Yes, I'm running 5.0.3. I'm hoping to be ready for the first start up this weekend. I'll give it a try then. I got it running. Still getting the same error and the throttle blade is still non-responsive to the FPS. Throttle continues to operate if you leave it in setup mode? The odd thing that it does in set-up mode is when I activate it, it opens the throttle about 60% (and the TPS shows 60%), but the throttle plate responds to the foot pedal as you would expect. Also, I noticed a new error code 71 has popped up now that I've got it running. I started the engine and the motor accelerated to my 4000rpm rev limit nearly instantly, as if the throttle was held wide open. I quickly shut it down. I had a look at the engine and made sure there were no vacuum leaks of any kind and that the throttle was closed. I started it again and it idled normally. I shut it off and restarted it. Again it raced to 4000rpm instantly. I shut it down, got my wife, and had her watch the throttle plate while I started it. It revâ€™d to 4K again and she said the throttle had opened completely when it started. I plugged the laptop in and couldnâ€™t find anything amiss and saw that the errors were still there. I reset them and the errors instantly returned. I then removed the E-throttle relay and started the engine 5 more times and it ran normally every time. I reinstalled the relay and started it again and sure enough it raced again. I then tried just turning the ignition on while my wife watched the throttle to see if it was opening from an external source independent of the ECU. I cycled the ignition switch several times and she said it never moved. After a few more times of re-starting it, most of the time it races to 4000 but every once in a while (maybe 1 out of 4 starts) the throttle stays closed and idles normally. Iâ€™ve checked the wiring and I donâ€™t find shorts of any kind and I checked the software and donâ€™t see anything that would tell the throttle to go wide open on start. Iâ€™ve attached the PCL file that I was using while this was happening. Are you able to get a PC log of all parameters when the throttle plays up. I suspect the throttle target is not what it should be at the point the butterfly opens up. I will be looking for odd readings off the pedal inputs or the E throttle target. With the laptop plugged in and recording, I attempted more than 10 start-ups. The rpmâ€™s never raced. Everything seemed normal. In frustration, I unplugged the laptop and on the first start up the engine raced. I plugged the laptop back in, started recording and started the engine a few times moreâ€¦ no problems. Again, I unplugged the laptop and started it up and again it raced. So I thought about the differences between the two scenarios. Aside from the laptop not being plugged in, the other difference is time. When I attempt to data log there is maybe 8 or 10 seconds from the time the ECU connects and I set up recording to the time I hit start. When the laptop is not plugged in, I am starting up in 1 to 2 seconds after key on. So I tried an experiment. If I turn the key on and wait 15 seconds or so, it never seems to race (with or without the laptop). But, if I start the engine immediately after turning the key on it generally wants to race. I did this several times and that appears to be the trend. Itâ€™s getting late here, but I will try and replicate this again tomorrow. I did some further testing tonight. I can say with fair certainty the thing that 'triggers' the runaway throttle is starting the engine within a second or so of the master switch being on. If I wait for 5 seconds or so before starting it never is a problem. I have two issues with the E-throttle at this time. The original error 73 which is keeping me from controlling the throttle with the FPS (unless in setup mode) and this runaway issue. We have just put up some new firmware / PC software. If you could update to 5.1.0 and advise if the symptoms have changed at all. Thanks! Should I update the firmware with my current software or should I use the new software to update the firmware? I installed the new software and firmware. Cleared the codes. Still have the same two problems - Error 73 and runaway throttle on engine start up. I might have an answer to the run away at key on. I suspect this could be due to the idle control settings. The figures are still set very much like there is a solenoid fitted but it is set as open loop E throttle. All the values including the startup step should be much smaller around the 1-2% figures. I see what you're saying and that makes sense. I wasn't sure if those values were in percent, but now I know. I'll knock those values down and give it a try tomorrow. However, even at the current 15% settings I wouldn't expect a fully open throttle, which is why I wasn't too concerned about those numbers. For the record, this is my first go at an E-Throttle of any kind. It would be best if you assumed I knew nothing about it. That said, are there any threads you can point me to that would help me understand the Vi-PEC specific settings and control methods? Perhaps if I had a better grasp of it I could diagnose better. Something interesting has happened, but I donâ€™t know if itâ€™s good or bad. I plugged the laptop in to make the idle changes that you requested. While doing this I noticed the TPS was reading 60% (same as when in set-up mode). I checked the software and it was NOT in set-up mode I checked the throttle plate and it was at about 60%. I cleared the ECU codes and error 73 did NOT return. I operated the FPS and the throttle plate responded. Two things that I see wrong with this is that you have explained to me that the throttle plate is not supposed to be functional until the ECU sees engine RPM. This is happening with the engine off. The other item is the 60% open plate when the FPS is approximately 0%. I attempted another calibration. It passed, but there was no change. A couple of additional notes to add to this â€“ Now when I start the engine it ALWAYS races because the throttle stays at 60% even after start. The other note is that the throttle plate becomes completely open (and TPS shows 100%) when the FPS is only up to 40%. I assume this is because 60+40 = 100. So, for the moment, itâ€™s half working. If the throttle plate was closed when the FPS was at 0%, I suspect Iâ€™d see a pretty normal throttle behavior. P.S. Is it possible the new "When Stalled" setting being set to "Run Throttle" instead of "Quiet Throttle" is what is allowing me to operate the throttle when the engine isn't running? Good news. I think we got it. You were right - the idle base position was nearly 60%. Fixing that table closed the throttle plate. RE: Error 73, my assumption is that the new software/firmware fixed it and I either needed to cycle the ECU again, or perhaps I just overlooked something. Hopefully that's the case and I don't have an intermittent 73. Time will tell. not sure if you first calibrated your tps then run the e throttle calibration in the setup mode. 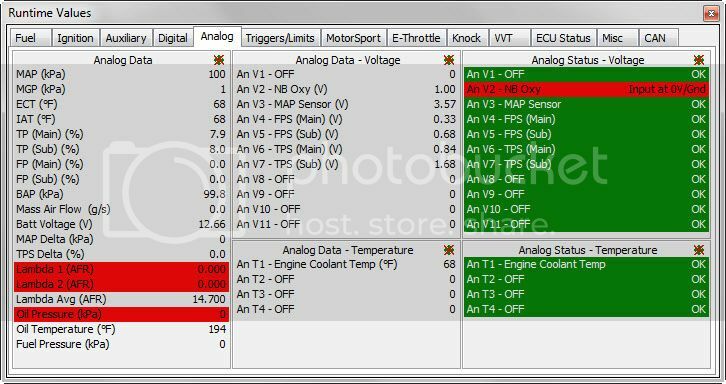 I went through similar issues in my 2jzgte vvti with e throttle. btw my throttle operates when engine is not on. I can hear it moving when I press the throttle. Not sure I follow you. Per the help file, I first calibrated the FPS and then the TPS. Are you saying that you did it the other way around and that fixed your problem? yes that is what Im saying. it took a few times but eventually it worked for me . it is also noteworthy that my fps and tps are wired in together as the Toyota fps would only go up to 80 % if I didn't Id be getting errors as the tps and fps would not read same and it would spit out errors. I have had no issues running like this at all.